For all volunteer opportunities, please complete the Volunteer Application and return with your cover letter and résumé, and (Law Clerks Only) writing sample to Andrea Del-Pan, Pro Bono Director, at probono@baylegal.org. Please email probono@baylegal.org with any questions. Consumer Protection: Assist low-income consumers with debt collection, credit reporting, student loan and foreclosure matters through consumer education, pro per clinics, workshops and full representation. BayLegal staff and volunteers assist self-represented domestic violence survivors complete the paperwork and understand the process to request a restraining order and important custody, visitation and support orders. Domestic Violence Restraining Order Clinics: BayLegal staff and volunteers assist self-represented domestic violence survivors complete the paperwork and understand the process to request a restraining order and important custody, visitation and support orders. Consumer Rights Legal Clinics – BayLegal staff and volunteers assist self-represented litigants in limited civil debt collection matters. 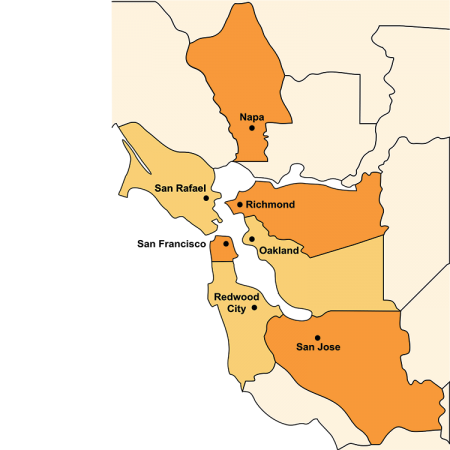 Clinics are offered weekly in Bay Point, Fremont, Redwood City, Richmond, Napa, and San José. BayLegal screens all pro bono clients for eligibility and determines whether a case is appropriate for pro bono representation. BayLegal provides training, manuals and samples, and ongoing mentorship throughout the pro bono project. Limited Scope Representation in Domestic Violence Restraining Order Hearings – Volunteer attorneys provide limited scope representation (appx. 1 or 2 hearings) for domestic violence survivors seeking permanent restraining orders and important related child custody, visitation and support orders. Volunteers receive training, a practice manual and sample pleadings and ongoing mentorship. Opportunities are available throughout the year and the project runs a summer associate program. Estimated time commitment: 25 hours. Protecting Domestic Violence Survivors and their Children 2009 PART I Oct 2009: Overview of Domestic Violence Restraining Order law and procedure Overview of Domestic Violence (definition, cycles of violence and working with survivors); Domestic Violence Prevention Act Restraining Orders (law and process/procedure); mock attorney-client interview. Immigration Relief for Survivors of Domestic Violence and Violent Crime: (VAWA Self-Petitions and U Visa Non-Immigrant Petitions) are means to immigration relief for Victims of Domestic Violence, Sexual Assault and other Violent Crimes who are either immediate family members of abusive US Citizens or Legal Permanent Residents OR who cooperate with law enforcement in the investigation and/or prosecution of the crimes perpetrated against them. With BayLegal’s training and ongoing mentorship, Volunteer Attorneys have the opportunity to work with clients to: Elicit facts related to the abuse suffered and help prepare client’s declaration; Prepare immigration petitions and related forms; Collect supporting evidence and documents; Understand the broader immigration petition process; and Obtain work authorization and benefits vital to fleeing and recovering from abuse. TRAINING: Webinar and live trainings available. Youth Justice Pro Bono Project: Representation of Poor Foster Care Youth to obtain needed health and financial benefits. Pro Bono Attorney/Volunteer (license is not required) meets with the client at BayLegal’s Oakland office or receives direct referral of a case. Volunteer attempts to negotiate for appropriate benefits, if initial attempts to negotiate a settlement are unsuccessful, the volunteer submits a Request for administrative hearing, prepares a Position Statement (due day of hearing), and provides representation (hearing is approximately 3-4 weeks from Request). Estimated time: 25 hours. Hypothetical Case: Child is removed from parent(s) by Child Protective Services (CPS) and dropped off with grandmother or other relative. The grandmother receives help with applying for and obtaining Child-Only CalWORKs (appx. $370/month), but is not informed or is denied AFDC-FC ($450-$700+ funds to help address additional needs). The denial of these additional benefits may result in the child returning to the CPS system because the family member lacks the means to provide for the child (causing further instability, etc). TRAINING: DVD and live trainings can be arranged. Family Law Pro Bono Advocacy Program: BayLegal provides training and mentorship to attorneys interested in assisting low-income family law litigants with limited and full scope representation in family law matters, including Dissolution, Domestic Violence, Custody, and Support.